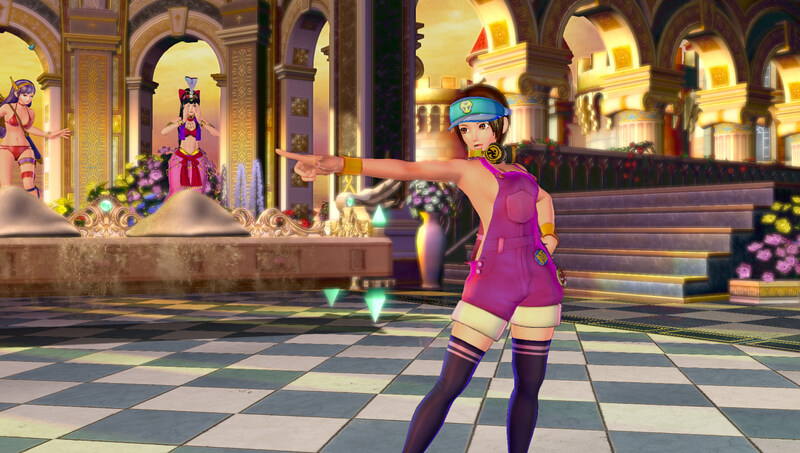 Buxom girls with cheeky costumes and sassy one-liners: SNK Heroines revels in offering a more lighthearted, comedic fighting game for SNK fans to jump into and mess around in. 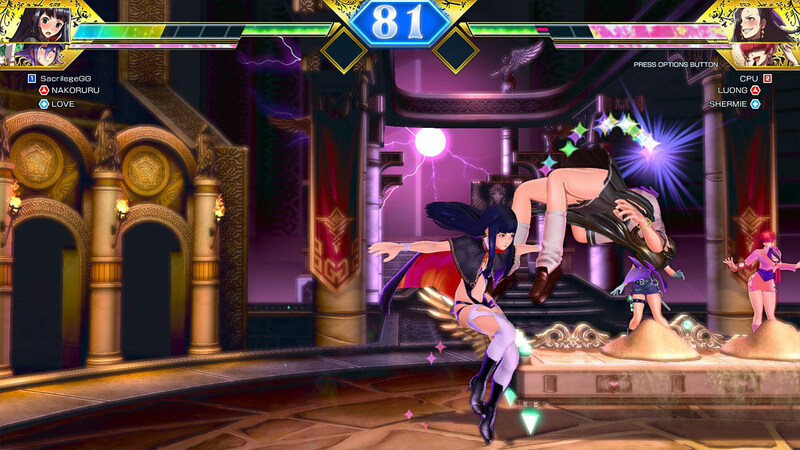 Pulled into a different dimension and outfitted in outlandish costumes, cast of SNK Heroines: Tag Team Frenzy find themselves forced to fight by an ominous, theatrical villain looking to collect and capture beautiful women the world over. 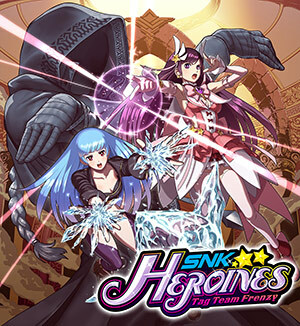 Featuring memorable characters from SNK’s decades-long history, SNK Heroines: Tag Team Frenzy brings together some of the most popular women across classic fighting series such as King of Fighters, Fatal Fury and Art of Fighting, as well as pulling characters from some of their pachinko machines, including Shodown‘s Nakororu, Shermie, and the ever-popular Mai Shiranui. Terry Bogard returns too, but… not quite as you remember him. 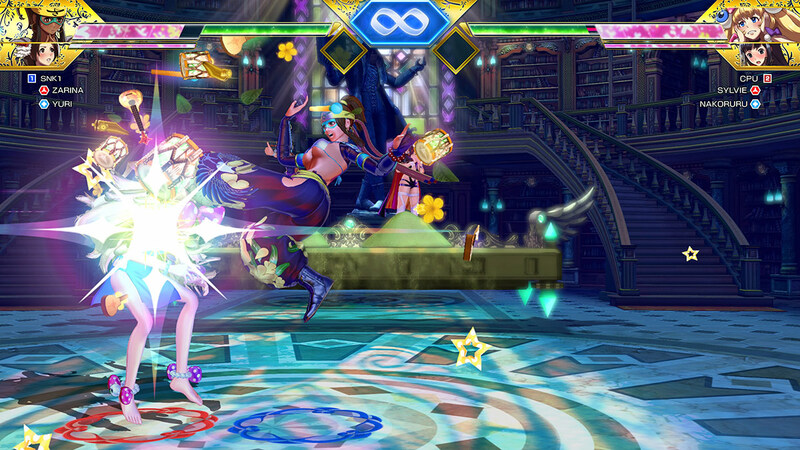 Presumably with a more casual audience in mind, SNK Heroines feels like a stripped-down (excuse the pun) fighting game. Fighter staples such as complex combos, frame-specific evades and counters, and even crouching — all gone. Heroines instead favors a more button-mashing approach, allowing for combo attacks with a constant press of just one single key, and a character’s super moves another one button press away. It’s a little jarring regardless of whether you prefer more technical fighters like Soul Calibur or more execution based titles like King of Fighters; play in Heroines mostly revolves around maximizing use of dash escapes and gratuitous use of the new dedicated block button, which blocks virtually every attack in the game (barring throws, of course). Heroines makes no effort to pretend to be the next big Evo regular. Instead, it seems more like a fun little brawler than you can mess around on with friends. The game revolves around a tag mechanic with each player choosing two characters from the roster to play with, though if you jump into Heroines expecting a Tekken Tag style match you’ll be quickly surprised. Both characters on your team share a health pool instead of having separate, slowly recovering health, so swapping between characters is more to mix up your attacks and utilise their separate stamina bars (power meters). Interestingly, simply depleting your opponent’s health to zero won’t knock them out for a victory. Once a player’s health bar reaches critical, they’re ready to be taken down by a Dream Finisher — a stylish special move that, if it connects with someone in critical health, works as an immediate KO. Dream Finishers are the only way to win but have a small wind-up window and are heavily telegraphed much like a Street Fighter super, so they can be tough to land against a skilled opponent, and they drain much of that stamina bar to cast. 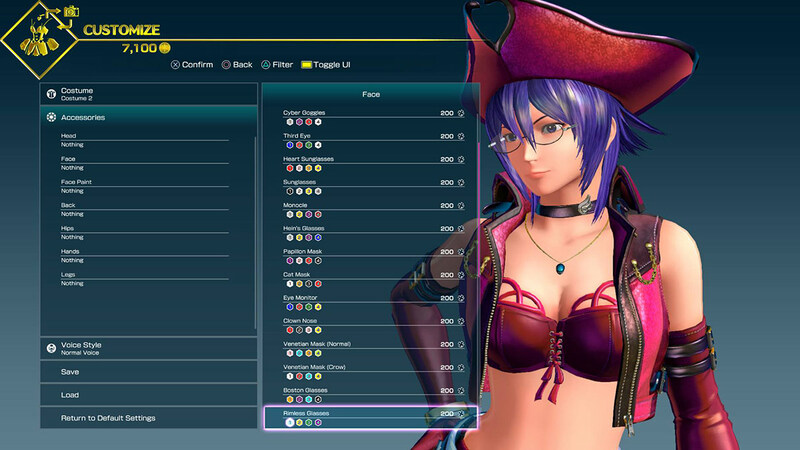 In addition to regular attacks and combos, SNK Heroines mixes combat up a little with random quirky items such as mines and bananas, collected from random placements on the stage that can later be fired around the arena. It brings a strange hint of Super Smash Bros to Heroines, and further enforces SNK’s lighthearted, casual approach to the title. SNK Heroines all of the usual game modes you’d expect from a modern fighter — online and local versus, story, survival and training modes, as well as a gallery for checking out various movies, audio and artwork from the game. The story mode is very short and perhaps the weakest part of Heroines, though there are some nice touches with how your chosen team talks to each other, especially interactions between characters who either already know each other from their own universe or have very different personalities. The game also allows some simple customisation for how your characters can look. Each has two additional outfits that can be unlocked, typically one being a key or original outfit from their origin franchise, and the outfits can be further customised by adding accessories, which can range from monocles and bangles to animal tails and silly hats. While not comparable with extensive custom builders that the likes of Calibur offers, it’s still nice to be able to play around and see how silly you can make a character look. GameCynic received a promotional copy of this game to review. This does not impact our review or score. We reviewed the PlayStation 4 version.